The Easter season is a journey that travels through streets of jubliation, stumbles into the loss of hope, wrestles with the patience of faith and culminates in the joy of resurrection and new life. We're hosting a series of services that reflect on that road, and we invite you to lay aside your Easter pre-conceptions, and enter into the season with us. Everyone is welcome. Gospel music extravaganza, baptisms & celebration! If you'd like to help out with hospitality for any of these events, we would love to have you! “Just as he (Peter) was speaking the rooster crowed. The Lord turned and looked straight at Peter. Then Peter remembered the word the Lord had spoken to him, ‘before the rooster crows today, you will disown me 3 times.’ And he went outside and wept bitterly.” (Luke 22:54-62). Peter was a disciple of Jesus. He walked with him daily and was in the very inner circle of the King of kings! How, under these circumstances, could he deny his savior? Having witnessed the power of God in so many miracles, how could he turn his face away? Fear. Peter was afraid. Afraid of being tortured and condemned for his association with Jesus. Afraid of being mocked and ridiculed for following such a fool as this…one who calls himself the son of God and yet now finds himself a captive. Doubt. Perhaps Peter allowed the words of the enemy, as he heard spoken through Jesus’ captors, to embed doubt in his mind…‘if this is the living God, why does he not free himself?’ The fact that we see this story in scripture is indicative of just how merciful God is toward us. Peter is frankly displayed in all his humanity. The essence of this depiction is that Peter, in his moment of revelation when Jesus looks directly at him, becomes broken-hearted as he fully understands what he has done and in his shame weeps bitterly. In that moment, any pride that Peter carried in his heart was stripped away. I believe he realized, perhaps for the very first time, that he was no better than even Judas. The mercy displayed is this: When we hit that moment of conviction; when we know we have sinned, and the grief we feel in remorse brings us to our knees, this is where genuine humility comes from. Kneeling naked and honest before our savior, through bitter tears we cry out that we are nothing, that we don’t deserve to be called friend, Jesus offers forgiveness in exchange for our betrayal. From here the Lord exalts us! Fulfilling the command to “love one another” is birthed out of sin, repentance and forgiveness…where we awaken to the knowledge that we walk alongside others as equals...all of us having fallen so short of the glory of God. Check out the work of our talented visual, poetic and technical artists, Nate Draper & Justin Mason, as they bring the Nicene Creed to life on film! We spent a good chunk of time on Sundays going through the creed, so here's a chance to refresh yourself on the core statements of what we believe. Lent 2014: Create. Participate. Encounter...Artists Needed! We're doing something a little different this Lent and Easter season, and would love to have your artistic involvement and participation. We've set up a special area on one side of the church near the blackboards, and want to fill it with art - either art in the making, art in motion, stationary art, or whatever else you may be inspired to do based on our weekly themes. The overall idea is to enter into the story of Jesus' journey to the cross each week as a whole community, and we're hoping to have artists in motion and creating during the Sunday service in our Lent space, or if that's too much pressure, bringing a piece to install that will invite the congregation to participate and meditate, and engage with Christ in a new way. Just think of it like an extended Stations of the Cross for the entire season of Lent as we journey together towards Easter - we may also set up a station every week and incorporate it into our collective worship time. If you have any ideas, big or small, or want to sign up for one of the weekly themes below, please let us know and we can get creating and creative! Also, if you know of any artistic folk or friends who would love to participate, spread the word! Ash Wednesday marks the first day of the season of Lent. Join us at 7th & Collingwood bright and early Wednesday morning to mark the beginning of Lent with a simple devotional service led by our pastor, Tim Horman. This Sunday, January 12, we are launching a new preaching series, which is going to be something a little different to anything we have done in the past. 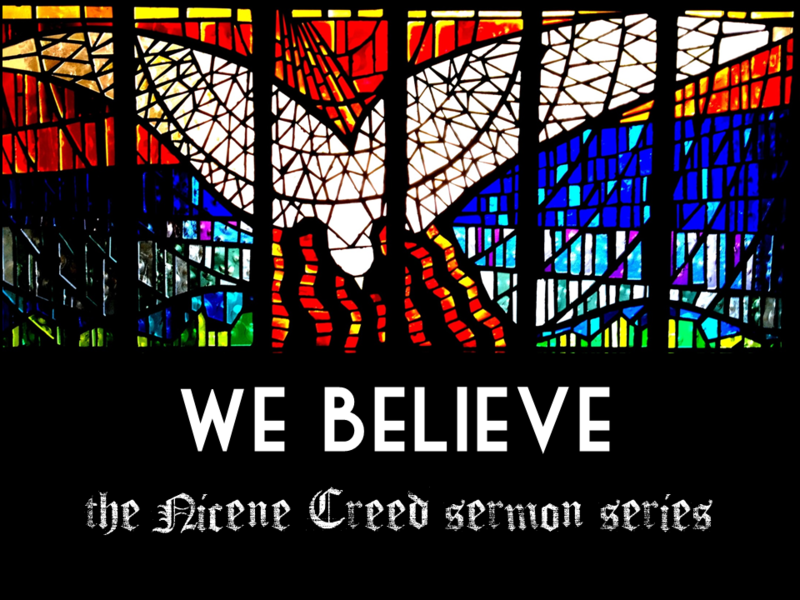 For the next few weeks we'll be looking at the Nicene Creed, which is an amazing document, and historically one of the most important for the church, apart from Scripture. Alongside the content of the creed, we'll be looking at why the Nicene creed was written, why it is still important for us, and as we look at each section of the creed over the next few weeks, we will be unpacking the many key passages of Scripture that it is based on. It's going to be a fun journey, and I'm really looking forward to sharing it with you. On the Road: Advent Artists & Writers Needed! Advent will be a season of travelling for us which was unexpected in terms of our Christmas planning and focus. We'd love to see some art, writing, prayers, photographs, crafts, meditations and music that would walk us through the season in a creative and consistently themed way. It's interesting to note that all the principle characters in the Advent story are on the move: the wise men trekking far from home, Mary & Joseph in a hostile country and without advance hotel reservations; the shepherds outside in the fields then led to leave their area of comfort and work and travel somewhere else to discover Jesus. It won't be intensive, but will require some planning ahead and commitment. If you would like to contribute, please contact Sarah Kift (sarah@pgcc.org) to sign up - include your area of interest, theme, and what you are able to contribute. We will be formalising our Advent plans based on your contributions, so don't wait too long to sign up, as what you give will shape what we do! "And so it is of critical importance that the men and women who care fervently about life...life-in-formation, the Christ-formed life...be passionately attentive to the use of language." Are you a writer? Interested in language and the way it shapes community? Looking for a community to write for and within? Are you someone with an imagination that tends to come out through paper and pen (or keyboard)? We are looking to start a writing community that both produces work for our church (prayers, liturgy, plays, devotions, songs, special projects) and creates encouraging, constructive space for personal growth and development of the writing craft on a regular basis. Teaching, writing prompts, giving and receiving of feedback, special projects, fun literary events, celebration of works, ongoing church communications and peer support/mentorship will all be part of the Open Road community. Email writing@pgcc.org to get involved - there is room for a handful of leaders to help shape the road ahead and anyone with a passion for words to join in. Once we have two or three writers/leaders gathered, we'll start to meet together to do some writing on a regular basis in the next few months.